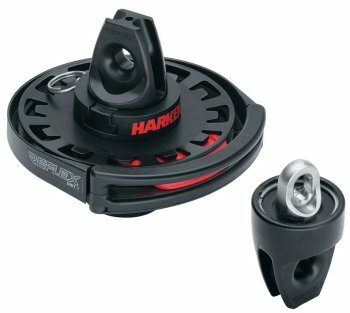 The Harken Reflex furling system is a game changer! The previous generation of free-flying sail furlers often resulted in partial or uneven furling. 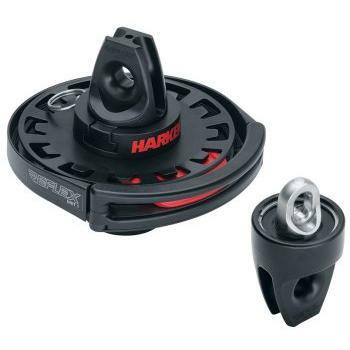 Patent-pending Harken Reflex furlers provide sailors confidence that their free-flying spinnakers, gennakers, and code sails will furl with speed and control. The result? Sailors use downwind sails more often—even when sailing shorthanded. The compact drive unit is easier to handle than other designs. Pull the furling line and the drive unit reacts reflexively to rotate the torsion cable, immediately transferring torque to the head swivel without unwanted corkscrewing delaying the response. The head swivel reacts instantly, spinning the sail smoothly and completely from top to bottom for an even roll-up and super-tight wrap. The furled spinnaker lowers easily to the deck, ready for the next hoist. Unit 1 is rated at 1.5T MWL for boats to 11 m (36'). Unit 2 is rated at 2.5T MWL for boats up to 14 m (45').